Hey everyone! 👋 We’ve just pushed another set of updates to HappyForms, improving the overall experience and fixing bugs. Here’s what shipped in version 1.4.4. Improvement: New Advanced link added to each form part. Clicking it reveals more advanced settings related to the part. The result of this is a cleaner look for when parts are first opened in the builder. Improvement: Better compatibility with themes. We tightened our CSS rules to persist the styles of HappyForms parts across popular themes. 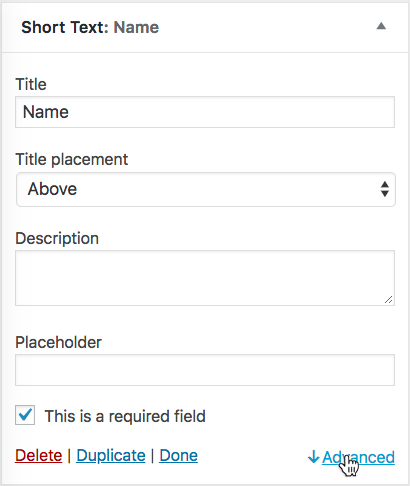 Bug fix: Input placeholders behavior when Title Placement was set to Display as placeholder. Bug fix: Responses screen was showing just a first letter of submitted data. Bug fix: PHP notices were visible when adding HappyForms widget in Customizer.